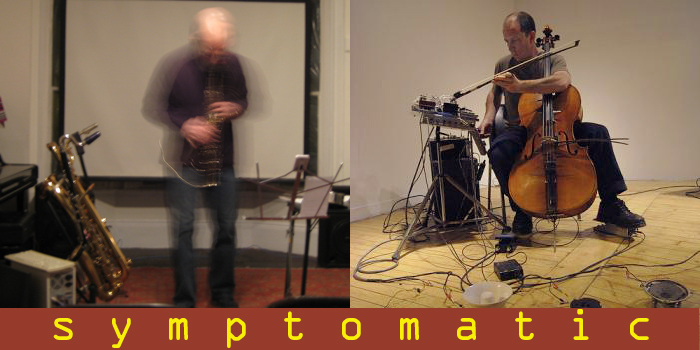 Symptomatic is a piece or operating mode that Vic Rawlings and i have been working on since our east coast/mid-west tour in May of 2009we performed the prototype on the last night of the tour in Pittsburgh, Pennsylvania, and have subsequently been refining and focusing it ever since in rehearsal and performance. The piece focuses on the simultaneity of disparate languages, their dramatic contrast and (possible non-) interaction and coexistence. On September 22, 2011, we performed on Susanna Bolles Rare Frequency show on WZBC Newton 90.3 FM. As is her standard practice, she posted a lovely set of photos from the session on Flickr.